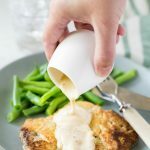 Easy Keto Low Carb Chicken Fried Steak that even your non low carb family members will love, it’s that good! 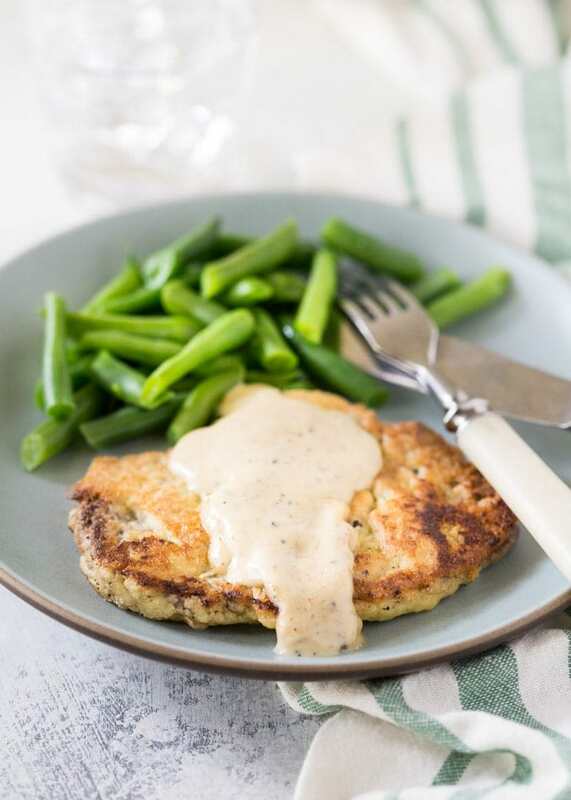 This recipe is low in carbs with 4g net carbs per serving and high in fat with 46g per serving. 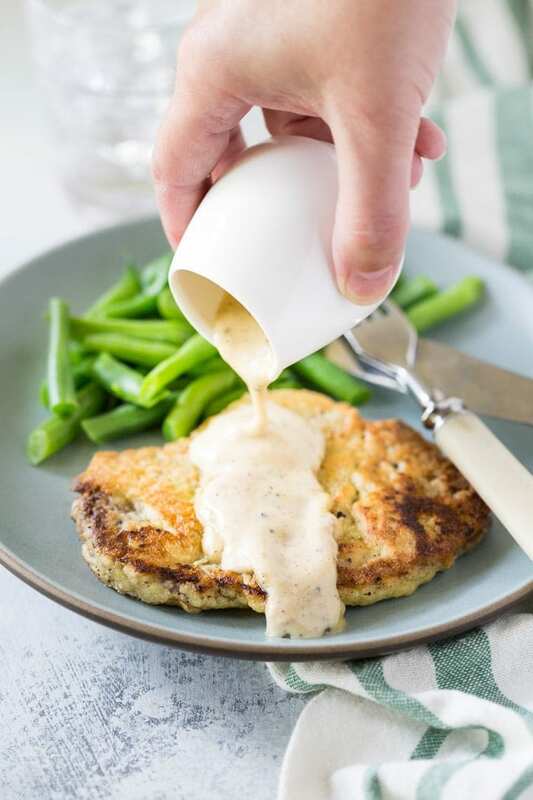 Seasoning is important for your low carb chicken fried steak, so start by lightly seasoning your steaks with a little salt and pepper each side. Then add the heavy cream to a bowl along with the Worcestershire Sauce, Dijon mustard, and a little more salt and plenty black pepper, then set aside. Beat the egg in a bowl or container suitable for dredging the steaks in and put the almond flour into a similar separate bowl (see photo below) and add a little salt and pepper and garlic powder. Pound steaks to an even thinness using a meat mallet. If you are using top round beef steak instead of cube steak then you’ll have to pound the steaks quite thin or they won’t be tender. Heat the oil in your non stick skillet then dredge the steaks in the seasoned almond flour first, then dip in the egg, then once more in the almond flour. Add two breaded steaks at a time to the skillet cooking for about two to three minutes per side, or until slightly browned. Keep an eye on the heat, almond flour has a tendency to burn if the heat it to high. After the first two steaks are cooked, remove them from the pan and add half the heavy cream for the sauce to the skillet and cook over a medium high heat until the cream is bubbling and very hot, stirring all the time to get the browned meat juices off the base of the pan and until the cream sauce thickens which will take two to three minutes. I find it best to clean the skillet a little at this point as the almond flour from the first batch of steaks tends to burn when you add the second batch. Repeat the same process for cooking the steaks and then the remainder of the cream sauce as before, then serve hot! What kind of meat is used for Chicken Fried Steak? Contrary to what the name suggests, Chicken Fried Steak is made with cubed beefsteak. The ‘Chicken Fried’ refers to the method of cooking which is similar to that of pan-fried chicken breast cutlets. What is the difference between country fried steak and chicken fried steak? 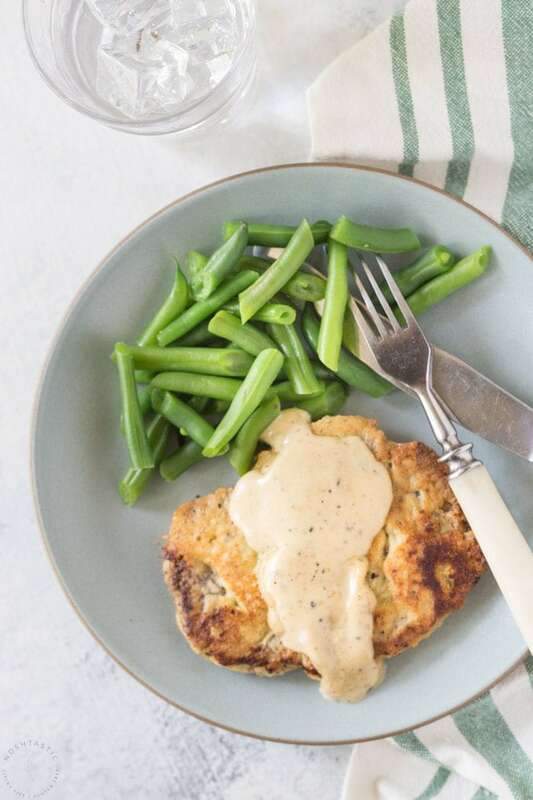 How many calories are in a piece of chicken fried steak? How many calories in a piece of chicken fried steak will depend on the size of the steak and the other ingredients used. For my recipe the calories per serving are approximately 527 including the sauce. I used my trusty cast iron skillet to cook the steaks, it’s well seasoned and so it’s non stick. This is important otherwise your breading will stick to the pan. I used a meat mallet to pound the steaks, and a cutting board set that’s similar to this one. 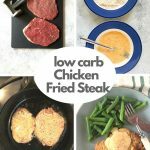 Quick and Easy Keto Low Carb Chicken Fried Steak that your whole family will love! from Noshtastic. Mix the heavy cream with Worcestershire Sauce, Dijon mustard and a little salt and generous amounts of black pepper, then set aside. Beat the egg in a bowl or container suitable for dredging the steaks in. In a similar separate bowl, add the salt, pepper, and garlic powder to the almond flour and mix well. Pound steaks to an even thinness using a meat mallet and by placing the steak between two pieces of cling wrap. If you are using top round beef steak instead of cube steak then you'll have to pound the steaks thin or they will not cook tender and become tough. Salt and pepper the meat just a little and set aside. Dredge steaks first in seasoned almond flour, beaten egg, and then almond flour again. Set steaks aside on a plate and repeat with remaining steaks. Add enough oil in a well seasoned large cast iron or other non stick skillet to cover the bottom by 1/8th inch. Heat oil until it sizzles when you drop a little flour in it, do not overheat the oil. If you don't use a suitable non stick skillet the coating will simply stick to the pan. Add two breaded steaks at a time to the hot oil, cooking for about two to three minutes per side. Keep an eye on the heat and turn it to medium so that the almond flour breading does not burn, but the steaks continue to sizzle. Carefully turn the steaks after a couple minutes and once they are slightly browned. Remember the almond flour coating is fragile and if you're not careful when you turn it, it may slide off the meat. 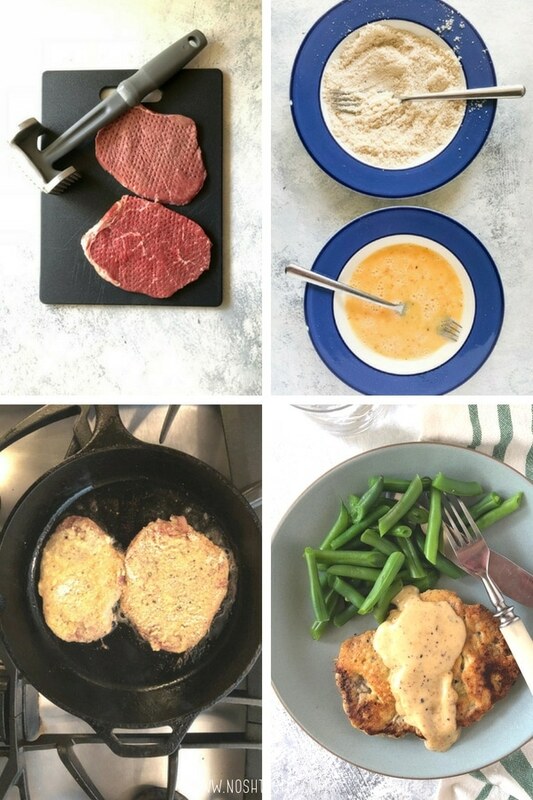 After making the first batch of steaks and cream sauce, clean the skillet and then repeat the cooking process with the remaining two breaded steaks, then make the remaining cream sauce as described above. Please note, you MUST use a really well seasoned cast iron skillet, or a non stick skillet otherwise the almond flour coating is likely to stick to the pan or simply slide off the meat, it's not as sturdy as regular wheat flour breading and quite fragile. Contains 4g net carbs per serving. Serving size is one 2.8 ounce or 80g thin beef cube steak plus 1/3 cup cream sauce. I find it better to cook half the cream sauce after the first two steaks are cooked, then clean the skillet, then cook the remaining two steaks in the cleaned skillet, then cook the remainder of the cream sauce after that. The almond flour has a tendency to burn if you cook two batches of steaks back to back without cleaning the pan in-between. AMAZING! 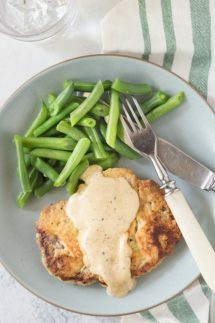 We love this recipe for keto chicken fried steak, deffo the best we have tried so far and the grazy/sauce is to die for! It does definetly work best if you use a non stick pan, it’s a keeper!! Yay, so glad you love it! Made this recipe for dinner. I made the gravy but added beef bouillon to the cream with onions and pepper with a side of cauliflower purée. It was excellent.